Talon® is a versatile single-feed rodenticide for professionals. Incorporating the potency of brodifacoum in a range of high-quality baits. 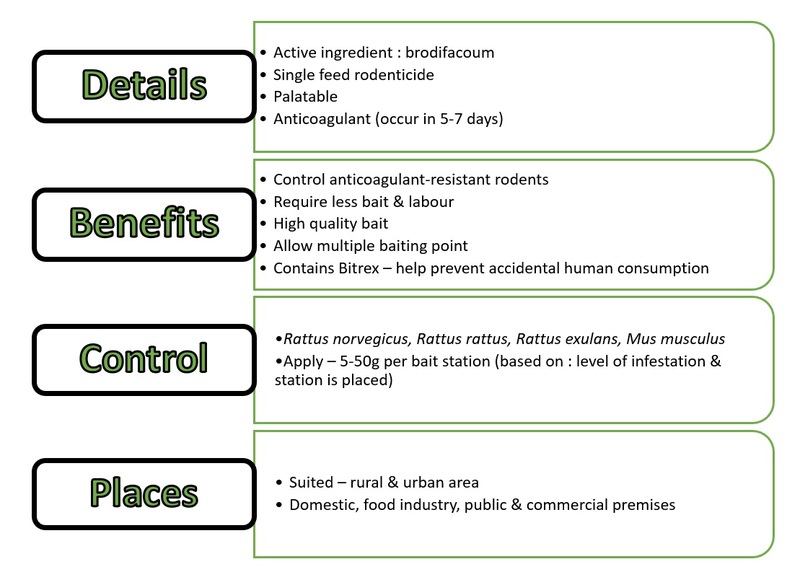 Talon also controls resistance rodent populations, delivering exceptional results, every time. Talon Pallets are palatable with outstanding results in field trials and in the laboratory. They are suited to use in both urban and rural situations and are is ideal for use by the food industry and in most domestic, public and commercial premises. Talon Pallets are best laid in bait trays and bait boxes in dry situations and environmentally-stable conditions. Talon is a single feed 2nd generation anticoagulant rodenticide containing the active ingredient brodifacoum. It is avaible in an easy-to-use bait formulation which is both attractive and palatable. A lethal close is consumed in a single feed representing just a fraction of a redent's normal daily food requirement. The product is reliable and give good results especially on warfarin resistant redents and when other rodenticide formulations have failed. Baits shyness seldom occurs. Talon acts by reducing the ability for blood to clot resulting in death occurring between 5 to 7 days. It can control Rattus norvegicus, Rattus rattus, Rattus exulans and Mus musculus.